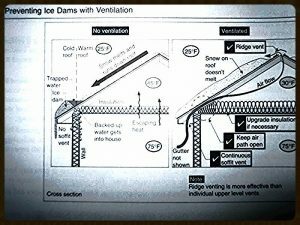 Your Questions on Ice Damming | Inspect A Home, Ltd. It seems in the last few years ice damming has become prevalent because of the quick thaw and freeze over winter months.Other than the last few years, it seems like we haven’t been confronted with so many ice damming problems since the early to mid 1990‘s. What I am about to discuss will probably address most ice damming issues as a result of attic ventilation or in this case the lack of attic ventilation. Take a look at the left diagram, it is similar to the above diagram. Here you will also see typical interior heat escaping into the attic and causing the exterior roof’s temperature to rise above freezing and melt the snow. However, without the lack of a continuous ventilation or flow of heat to the outer portions of the roof, also known as eaves or soffit areas, these areas of the roof will remain at temperatures below freezing. Therefore, when the snow melts from the top of the roof and begins to flow down towards the eaves, ice will begin to form and build-up. This is where the ice damming begins. Once this has started it is difficult to stop water from going up under the shingles and either into the house or running down the siding and possibly the interior framing. At this point the ice and snow build-up will need to be removed. As you will see in the lower right diagram; there is ventilation at the ridge and eaves/soffits. Many times at inspections I will see these areas blocked off by insulation. The fix for this would be to pull back some of the insulation to allow ventilation. However, I always suggest baffles be installed between the rafter bays at these areas to ensure they will not be blocked. Of course the best line of defense would be to install attic installation with greater “R” values. 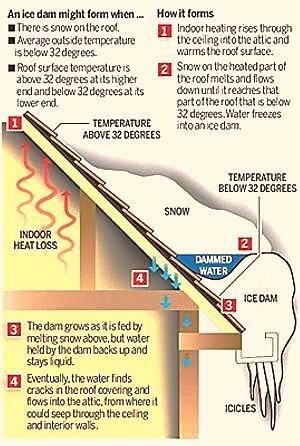 This results in reduced heat entering the attic coupled with the installation of roof or eave protection. This is a material that is a self sealing, peel and stick modified bitumen product that comes in three foot rolls and is generally referred to as “Ice and Water Shield” This is installed under the roofing materials at the lower sections of the roof and around chimneys, skylights etc. This protection was developed and has been installed on roofs since the 1990’s because of all the ice damming problems experienced then. I know many homeowners may have older roofs that still have a remaining life span but do not have an ” Ice and Water Shield “applied. In this case homeowners are advised about the ventilation, insulation and to consider the installation of electric heating lines on top of the roof’s susceptible areas ( eaves). I always remind homeowners that if the ice damming has occurred already, these electric heating lines will not be effective in stopping the problem in due time. I hope this answers some of your questions and fell free to call or e-mail me at anytime.